Dori Greenspan, you have put us on to something that is so simple, so quick to make, a minimalist recipe indeed. I like the hands-on technique of taking your fingers and rubbing the sugar with the lemon zest. You really can smell the flavor. This cake has a rich buttery, almondy flavor with a hint of lemon and is topped with sliced amonds with a little sugar to make a crusty top. You will love serving this to drop-in visitors. It is almost ready in the time it will take you to make a pot of coffee or tea. Center a rack in the oven and preheat the oven to 350 degrees F. Butter a seasoned 9-inch cast-iron skillet or other heavy ovenproof skillet, a 9-inch cake pan or even a pie pan. Pour the sugar into a medium bowl. Add the zest and blend the zest and sugar together with your fingertips until the sugar is moist and aromatic. Whisk in the eggs one at a time until well blended. Whisk in the salt and the extracts. Switch to a rubber spatula and stir in the flour. Finally, fold in the melted butter. Scrape the batter into the pan and smooth the top with a rubber spatula. 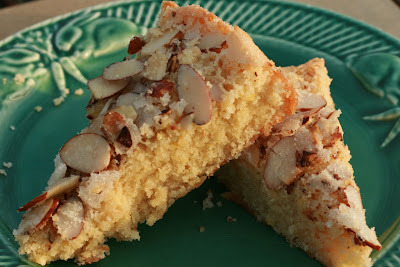 Scatter the sliced almonds over the top and sprinkle with a little sugar. If you're using a cake or pie pan, place the pan on a baking sheet. Bake the cake for 25 to 30 minutes, or until it is golden and a little crisp on the outside; the inside will remain moist. Remove the pan from the oven and let the cake cool for 5 minutes, then run a thin knife around the sides and bottom of the cake to loosen it. You can serve the cake warm or cooled, directly from the skillet or turned out onto a serving plate. 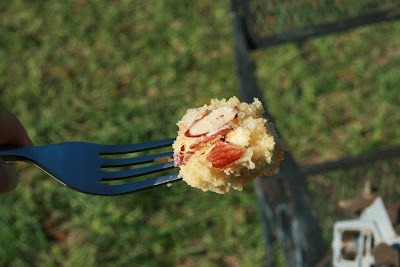 I love anything with almond, so this looks like something I need to try. I love the simplicity of it. I'm a horse gal, too-- who once had a barn full of horses. I'm down to one, living in a subdivision, but I still have that love of barn perfume. Debby, you are in for a real treat with this recipe, so simple and the flavors really shine through. Horses are wonderful, aren't they? I noticed you have an Arab, my favorite of all breeds. I have three, one of which is lame, but doing pretty well overall. Thanks for your comments and hope you like the cake! Wouldcha look at this flirty cabbage?